Wow where has the time gone?? It’s been ages (too long) since I have sent out a clinic update and in that time a lot has happened. Hopefully your pets have been happy and healthy and have found their spots next to the nice warm heater in preparation for winter. I’m sure most of you will have met our newer vets Dr Nigel Gifford and Dr Ally Davis (the one below on the left) by now. In October 2016 Dr Nigel made the move from another local vet practice and is really enjoying being able to focus on small animal work, so much so he is currently studying to sit exams with the Australian New Zealand College of Veterinary Surgeons to further advance his knowledge in small animal internal medicine. 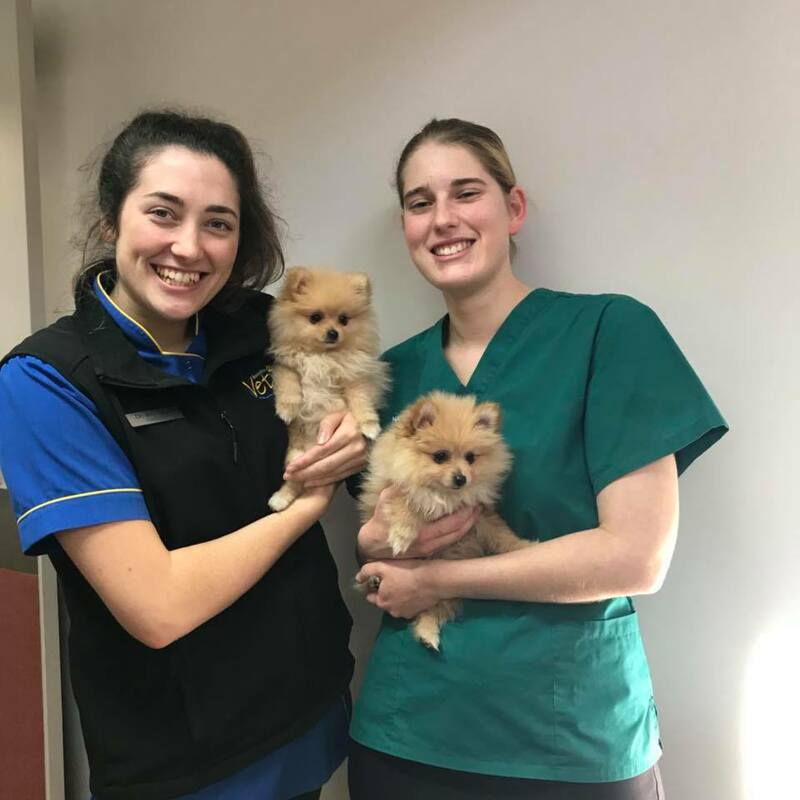 In February 2017 Dr Ally Davis joined our team after graduating from Murdoch University, Dr Ally is really enjoying being out in practice after studying for so many years and has been seeing some really interesting cases. She has slotted in really well to our veterinary family and is looking forward to attending the World Small Animal Veterinary Conference at the end of September in Singapore…… AND…… You must have met our handsome clinic dog Pippin by now or seen him on our Facebook page. Pippin is a Labradoodle and as you can tell from the picture loves hanging around the clinic, often using the walls to hold him up in his slumber. He is a real character and is super friendly, make sure you say “Hi” to him next time you are in. Bumper Stickers – I have been trying really hard to come up with a fun way to distribute our new bumper stickers out to our clients that want them, so this months promotion running to the end of July is for you to come in and grab a bumper sticker for your car, snap a photo of your car with the sticker and post it on our Facebook page or email it in to me, all entries will go in the drawn to win one of our new HP4L Complete Care Plans that we are launching on the 1st July (Value $480). CARE PLANS – I am super excited about getting to launch our new care plans on the 1st July. I have spent the last week getting our computer system set up for a seamless transition from our current Healthy Pets 4 Life Packages into the new HP4L Care Plans. These plans will offer our clients 3 levels of coverage with an Essential, Complete and Ultimate option each with varying degrees of benefits. One of new features of these plans is the option to sign up for a monthly direct debit options so as to spread the cost out over the year for you. Keep an eye on our Facebook page for more information about our launch. Well that is the most pressing news I have for you. Thank you for taking the time to read our clinic update, I will make sure it is not as long between updates going forward. Enjoy your evening and give your fur-babies a pat from us.